You’ve probably seen graffiti or tagging somewhere when you're out and about. It’s the words, colours and shapes drawn or painted on buildings, overpasses, trains and fences and other surfaces. It ranges from simple, one colour nicknames (called ‘tags’) to complex arrangements of several colours. It’s done without permission and it’s against the law. Graffiti is a blight on our environment and extensive resources are needed to combat it in our communities. Graffiti vandalism or tagging is a community problem that can lower property values and encourage more vandalism and other types of crime. It suggests that the neighbourhood doesn’t care and isn’t able to cope with the problem. Tagging left intact merely attracts more tagging. It’s not ok to look the other way. Together there are things that we can do to significantly reduce graffiti. Take action against tagging – record, report, remove. A strong community response sends a clear message to those involved in tagging that "We will not tolerate it here!" Many people make a real effort to keep their properties free of graffiti. Be proactive and keep your property clean or report tagging immediately to the appropriate organisation for removal. Internationally, graffiti or tagging is the most common form of vandalism. Overseas studies have shown that the problem of graffiti, if unaddressed, creates an environment where other, more serious crimes such as burglary and assault may take hold. Direction of travel if they leave. Whether they are walking or in a vehicle. Registration number and description of vehicle. removal. This helps when taggers are brought before courts. If you can do this without alerting the offenders the Police have a better chance of catching them in the act. The Police will prosecute offenders when caught. The defacement of property by graffiti constitutes an offence of intentional damage under the Summary Offence Act 1981 and can result in imprisonment or a fine. The typical tagger repeats their scrawl as many times as possible to advertise to other taggers for recognition and status. If graffiti is removed quickly, the taggers are denied their glory. Keep some paint handy and simply paint over any tags that do appear. If you do suffer repeated graffiti, be persistent. If need be just paint a patch over the tagged area rather than repainting the whole wall or fence until the graffiti has stopped for an extended period. Rid an unpainted wall or fence of graffiti by sanding or waterblasting. Waterblasting is very effective on unpainted surfaces. The smoother the surface the more easily it can be cleaned. On unsealed porous surfaces such as brick, concrete and unpolished stone, even complete removal of graffiti on the surface still leaves behind its indelible message. Generally a painted wall is easier to keep graffiti free because any further tags can simply be painted over in the same colour as the original. Paint your wall or fence in dark colours - colours that will cover in one coat, such as brown and green, are most effective but may not be suitable for some surfaces. Tagging affects neighbourhoods whenever it is not promptly removed. Remember taggers love to add their mark to existing graffiti. If you property is continuously being hit there are some steps you can take to help prevent tagging. If your street front boundary does comprise an unbroken surface that may be appealing to taggers, consider coating it with an anti-graffiti system, such as Resene Uracryl. Once cured you will be able to quickly clean away graffiti with Resene Graffiti Cleaner without damaging the paint finish. Resene Uracryl is a high performance durable coating system that will provide defence against graffiti for many years. Don’t throw out any unused fence paint: keep it in case you need to use it again. Keep a small pot of your fence paint and a brush handy for quick touchups if needed. If hiring mini skip bins, request that you receive only graffiti free ones. Organise a paint-out. Gather supplies and community volunteers to remove graffiti in your neighbourhood. Form or join a Neighbourhood Support Group and develop initiatives to protect areas targeted by taggers. If you live in a graffiti prone area consider having a quantity of communal graffiti covering paint for all to use. Watch for groups acting suspiciously, particularly at night. Most taggers are aged between 10-21 years old. Ring police immediately if you see someone tagging. Tagging is wilful damage and therefore a crime. If you see any suspicious activity, report it to the Police. Take a note of the car licence plate if possible. If you know someone involved in graffiti crime, inform your local Police. Consider painting a mural on a communal area being targeted – this often works to deter graffiti and can be a very positive community project. Resene runs a regular Mural Masterpieces competition that assists community groups creating murals – see www.resene.co.nz/murals.htm for details. Outside of the Resene Mural Masterpieces competition period, Resene sponsors many community murals. You can apply for sponsorship online. Resene testpots are made using Resene Lumbersider so are ideal for creating murals. The paints, aerosols and marker pens used for graffiti are often acquired by illegal means. The vandal often stores the tools for committing graffiti in their bedroom. Parents should be alert to any unusual number of aerosol spray cans or marker pens in their children’s possession. Retailers should pay attention to any young person repeatedly purchasing items that could be used for graffiti. Don’t give up! The message must get through that we take pride in our community. Taggers get away with graffiti because people are reluctant to get involved. It only takes a few minutes to note licence numbers, get descriptions and call the Police but it could save hours of time and thousands of dollars fixing the graffiti that one tagger can cause. To report graffiti please call 941 8999 or email info@ccc.govt.nz. Visit the Christchurch City Council website for more information. Want to adopt a spot? Help the elderly or disabled who have had their property tagged to clean it up or paint over it. Volunteers receive resources to help them keep their adopted spot graffiti free. Resene donates good condition paint and grey waterborne paint collected through the Resene PaintWise service to not-for-profit organisations and schools. This paint is ideal for covering tagging. Find out more and register online or complete a request form at your local Resene ColorShop. 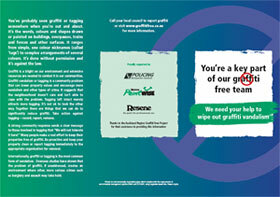 In the 18 months to February 2008 Resene has donated over 40,000 litres of paint for graffiti and community work. Resene TagCover is a custom made range of waterborne satin paints formulated to provide a budget friendly paint system to cover graffiti. Available in a standard colour range in 10L pails. Other sizes and colours available on request. Minimum quantities may apply. View standard colour range. Resene does not manufacture any spray cans of paint. We do not supply spray cans of paint as part of any sponsorships. As of 1 May 2008, Resene owned ColorShops only sell paint to bonafide trade customers. Spray cans are not available for public sale. View Architects memo no. 56: Clones are people two! For the most efficient obliteration of graffiti damage, which cannot be removed, the super-hiding Resene Contractor is unsurpassed.